Another Christmas is history, but Barbara and I hope that yours was as happy as ours was. It was a great weekend of visiting family and eating far too much, while the insulin pump got a good workout! We headed to Buffalo on Wednesday, arriving in time to enjoy a bucket of wings at Duff's, our favorite wing joint in the Buffalo area. The fine dining continued on Christmas Eve, with breakfast at Tim Horton's in Amherst, NY and lunch at Johnny's Hamburgers in Scarborough. Johnny's hasn't changed since my high school days, and the burgers, fries and shakes still taste as good 40 years later! We had a great visit with my family in Canada. Christmas Eve at my brother's home, followed by a quiet Christmas Day spent with my parents, and Boxing Day was capped by the entire Penstone clan gathering for a fabulous dinner at my sister's house. For the uninformed, Boxing Day is the day after Christmas Day, and is celebrated by people rushing out in the pre-dawn darkness to buy things they don't need or use up the gift cards they got the day before. I believe that down here it's called "Black Friday." Sunday was an early day for us, starting (of course) with another stop at another Tim Horton's before we headed for Pittsburgh to see the Penguins and Maple Leafs. Fortunately, the weather was good, the increased security at the border didn't slow us down too much, and we made it to da 'Burgh well before game time. We stayed at the Marriott across the road from the Mellon, and enjoyed a pre-game meal in the lobby bar. That gave Barb a chance to catch some of her Broncos stumblin' and bumblin' against the Iggles -- whoda thunk it that they would come back and almost beat Philly?? As is always the case when the Leafs visit Pittsburgh, there were a lot of Leafs fans in the hotel bar, which made for some interesting banter that continued inside the Mellon. All in good fun, with no one getting too carried away. thanks to Ian White's late 3rd period goal just after the Pens had tied it up. Pens played lethargicly, the Leafs inspired! Is 'lethargicly' a word?? An interesting side note -- while it took Barb and I less than a half-hour to cross the border at Buffalo, apparently members of the Toronto press corps weren't so lucky. Meanwhile, due to airport chaos and flight cancellations yesterday, only one reporter from a Toronto newspaper - that being a representative from the Toronto Sun -- was on hand for the Leafs-Pittsburgh Penguins game at Mellon Arena last night. In fact, in more than a decade of covering the Leafs, yours truly has never seen so few Toronto reporters sitting on press row at a Leaf game. There were only two, with AM 640's Jonas Siegel being the other. Hmmm - if only the Toronto radio crew hadn't made it! Hey, a guy can dream at Christmas, can't he??? Oh well, I'll be back at the Mellon in a couple of weeks for the Icers and Robert Morris. Training Camp - Old School! JoeBa sent me an email a couple of days ago with an interesting attachment that gives an insight into how hockey training has changed since the days of the Original Six. The letter from Maple Leafs coach and GM Punch Imlach to Jim Pappin outlines a "rigorous" training camp regimen. I'm sure today's players are rather envious! As Joe wrote: "The Leafs just need to simplify!!" Has Ron Wilson seen this?? Barbara and I are off to Toronto on Wednesday to spend Christmas with my family. Then we'll be hustling to Pittsburgh on Sunday to take in the Leafs and Pens at the Mellon, thanks to the generosity of one of the Icers' family! On behalf of my executive producer, I wish all of you a very Merry Christmas. It's a tough day to be with the Minnesota Wild. A day after the Wild beat the Canadiens in Montreal, the team's equipment today went up in smoke as the equipment van arrived at Scotiabank Place in Ottawa. Good thing they're not playing the Senators until Saturday night. Good thing there's a Pro Life Hockey store nearby! Wonder why this has never happened at the Greenberg?? Rumor has it that the fans chanted "don't tell PETA (clap clap clap-clap-clap)"
OK -- I know that it's a little late, but I figured that you still might enjoy a look at the Icers' 7-round shootout win that gave them a 2-1 victory over Delaware on December 4th. It's off-topic, but a big hat-tip to Ed Morrissey at HotAir.com for posting this interview with Navy head coach Ken Niumatalolo after the Middies beat Army on Saturday. I think that it's safe to say that the Penn State Icers and Niagara Purple Eagles weren't exactly in the spirit of the season on Friday night. I think that it's safe to say that the coaches are none too pleased with what transpired, despite the fact that the Icers cruised to a 10-3 win. I'll leave it to Tom Kinslow of the Collegian to give you the gory details of the game, especially the second period. Referee Tim Foreman had his hands full, calling 35 minutes in penalties and three game disqualifications! There are not a lot of positives to report, with a few notable exceptions. George Saad finally got off the schneid, recording a hat-trick that doubled his goal output in the first semester. Rich O'Brien scored his first goal as an Icer. As Rich's father, and former Icer, Rick told me in an e-mail, "Didn’t take him much to beat my scoring stats. I still have him on penalty minutes but it’s only a matter of time before that falls." But, I have to say the highlight of the night was the play of Niagara freshman Patrick Martin. Martin was called upon to don the pads after starting goalie Patrick Jankowski was tossed out during the melee at 7:57 of the second. After a delay of about a half-hour, Martin emerged from under the stands looking like a kid who had never played goal in his life. But in the first minute between the pipes he made several outstanding saves, including a diving case of highway robbery on Eric Steinour. The Martin family was listening to the webcast from their home on Long Island. Sue Martin e-mailed to say her son had played goal -- AS A 12-YEAR OLD IN ROLLER HOCKEY! Martin gave up 7 goals, but his 27 saves earned him third-star honors and several rounds of applause from the fans of both teams. OK, so the Icers finish the first semester with a record of 18-2-1 and winners of 13 of the past 14 games, which ain't bad at all. The second semester won't be a cakewalk, starting with Robert Morris U. at the Pittsburgh College Hockey Showcase at the Mellon Arena on January 8. As the players gear up for finals week and the holiday break, I'll have a chance to get to work on the video that we are putting together to mark the 70th anniversary of hockey in Happy Valley. One of the great pleasures of being with the team has been the opportunity to meet and get to know John Dufford. Mr. Dufford was a member of the original Penn State hockey team in 1939-40. 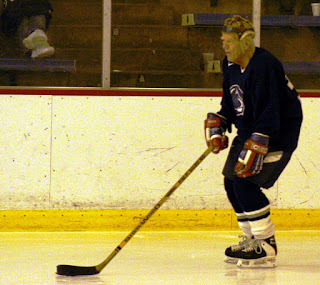 John is on the sunny side of 80, and up until a few years ago he skated in the Alumni Game. I still say that helmet should be in the Hockey Hall of Fame! I visited John at his home in Connecticut following the Rhode Island weekend. Here's the "Icers Pioneer" reminiscing about how he wound up on the team and how a coach could crank up his players as easily back then as they can today. December means the end of the first semester of Penn State hockey, and the annual pre-Christmas visit to Happy Valley by the Niagara Purple Eagles. 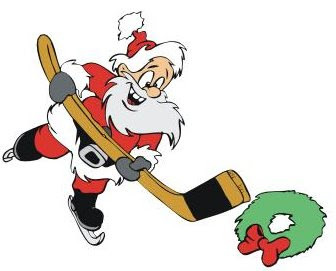 The Icers hope to go into the holiday break on an up note, having swept two from Delaware last weekend to run their record to 17-2-1 and 11-0-1 in the ESCHL. Penn State enjoys a four-point lead over Rhode Island in the conference standings, and a full ten points ahead of the 3rd place Blue Hens. I was able to drop by practice today and caught up with Matt Kirstein and Kurt Collins. Both returned to action last weekend, with Matt scoring in Saturday's 6-0 win. Both told me how excited they were to get back on the ice. The coaches did a good job of spotting both Matt and Kurt on the 4th line, not wearing them out in their first action in several weeks. Well, that was certainly interesting! Saturday's showdown between Penn State and Delaware turned into a 6-0 Icers rout. Unfortunately, the game turned into a wild affair in a rough and tumble third period. On Friday night the Icers got off to a slow start in the first period and stumbled out of the gate in the second before righting the ship and winning 2-1 in a 7-round shootout. There would be no repeat on Saturday. The Icers and Blue Hens both came out strong, with end-to-end rushes both ways. But it was the Icers enjoying a 2-0 lead after one as Matt Kirstein notched his 3rd of the season and Marek Polidor counted his 11th. Marek made it 3-0 early in the 2nd before Tim O'Brien and Dom Morrone worked a give-and-go for O'Brien's first short handed goal and 11th of the season. That goal sent Delaware goalie SJ Broadt to the bench and brought in Kurt Pflumm, who would not stick around for long. Mike Broccolo beat Pflumm for his 5th of the season and Chris Cerutti added his second of the weekend, 10th of the season and his 3rd power play marker, giving the Icers a 6-0 lead after 2. The third period turned into a free-for-all at 7:40, with the Blue Hens getting slapped with two 10-minute misconducts and a pair of game misconducts, including the aforementioned Pflumm. Less than a minute after the officials restored order, Delaware's Rocky Romanella came unglued and was hit with a game misconduct and an unsportsmanlike minor, while the Icers were awarded a penalty shot. Marek Polidor had a chance to get a hat-trick on the penalty shot, but he hit the post. Fortunately, cooler heads prevailed the rest of the way, with just one more penalty called by referee Foreman. With the win, the Icers improved to 17-2-1 on the season and 11-0-1 in ESCHL action, while Delaware dropped to 12-7-0 overall and 6-4-0 in conference play. With Ohio taking 2 from top-ranked Lindenwood this weekend and Illinois dropping at least one splitting at home with Kent State, there will likely be a shakeup in the next ACHA coaches' poll that comes out in two weeks. How much of an impact the Icers' sweep of Delware will have remains to be seen. Penn State will close out the first semester next Friday night when the Niagara Purple Eagles make their annual December trek to Happy Valley. Saturday morning and the snow is falling -- and it's time to get back to blogging after a week away from the keyboard. The Icers returned to the friendly surroundings of the Greenberg Ice Pavilion on Friday night for a big conference matchup against Delaware. The first period was all Blue Hens as they outshot the Icers 14-7 and led 1-0. It didn't look much better as Penn State stumbled and bumbled through a 4-minute power play early in the 2nd, but then things started to change. By the 40-minute mark the shots on goal were even at 22, but there was no scoring in the middle frame. It remained 1-0 until 4:59 of the 3rd, when Chris Cerutti took advantage of a deflection off a Delaware player. Chris broke in alone and beat Hens netminder SJ Broadt high to the glove side to tie the game. Marek Polidor and Teddy Hume picked up the assist on Cerutti's 8th of the season. For Ted - his second career assist. With no scoring through the overtime, it was off to the Icers' 3rd shootout of the season. This one went 7 thrilling rounds on some very dirty ice, which proved to be a big factor. The Hens noticed Hume building a snow fort in his crease that was quickly removed by linesman Tim Foreman. Gotta give Big T some points for trying! Cerutti almost overskated the puck right out of the gate on his attempt, but managed to get it back in his stick -- twice! John Conte, the shootout hero in Rhode Island, also overskated the disc, but managed to kick it up to his stick and then beat Broadt for a highlight reel goal. Hume came up huge, with a poke check on Jason Michaud that would make Johnny Bower proud and a sprawling save on Ryan McDonald. Paul Daley scored to open round 7, leaving it up to Andre Menard to try and keep the Hens alive. But Teddy made a huge left pad save on Menard before the net came off the pegs. As the Icers celebrated Menard pulled a Keith Ballard, slamming his stick on the boards at the Delaware bench, earning himself an inconsequential 10-minute misconduct at game's end. Speaking of John Conte, he faced younger brother David last night. Kudos to Delware coach Mike DeAngelis and Icers bench boss Scott Balboni for putting the brothers in their starting lineups as their parents and grandparents watched with pride. I didn't see any physical contact between the boys, but John made a perfect tape-to-tape pass to kid brother. Too bad the pass was intended for Marek Polidor! I had hoped to post my post-game interviews with Paul Daley and Chris Cerutti, but I only have the video. I left my audio recorder with the rest of the equipment at the arena, so there's no way for me to link the audio and video together.